Elle, my 7 year old, has been anxiously awaiting the loss of her first tooth. And, this morning, she was so excited to show me that one of her teeth is loose! It is amazing how such little things can bring such joy! 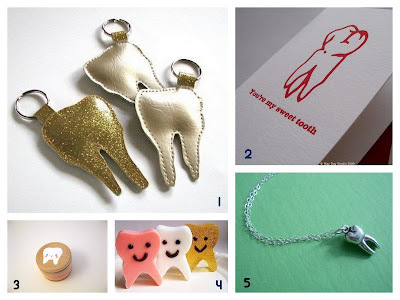 Today's post is an ode to all things teeth! 1. Gold Teeth Key Rings by Majesty Inc.